This allows you to choose the items of metadata which define a "scene" in DV AVI, DV MOV or Raw DV files. 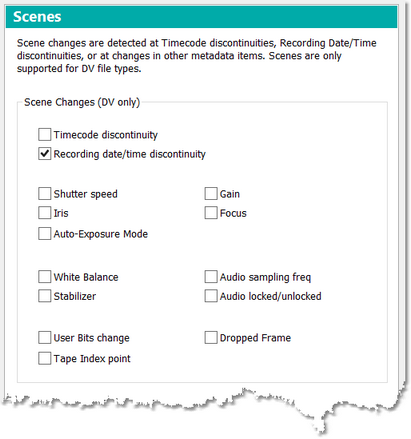 The first time you run DVMP Pro the default will be for Recording date/time discontinuity only to be checked, which means that a scene-change is considered to occur when the date and time jumps out of its natural sequence which will usually have been caused by the camera being stopped or paused during recording to tape. You can re-define a scene-change by checking any combination of metadata items. Whenever the chosen items change value then a scene-change is triggered. For timecode and recording date/time which are continuously changing then the trigger occurs when there is a discontinuity. For Tape Index point, the trigger occurs when the marker is detected. For Dropped Frame then the trigger occurs when a dropped frame is detected. Scenes only apply to DV file types.